1/2 tsp ground black peppercorn or black pepper. Mix all dry ingredients. If you don't have self-rising flour, you can add about 1 tsp baking powder to compensate. Mix the egg, water, parsley and onion tops. Add dry ingredients to mixture. The consistency should be like pancake batter and thick enough to spoon into the pot. If you prefer fluffier and spongier dumplings, add 1/2 tsp baking powder. Drop the dumplings from a teaspoon or tablespoon into the gravy. 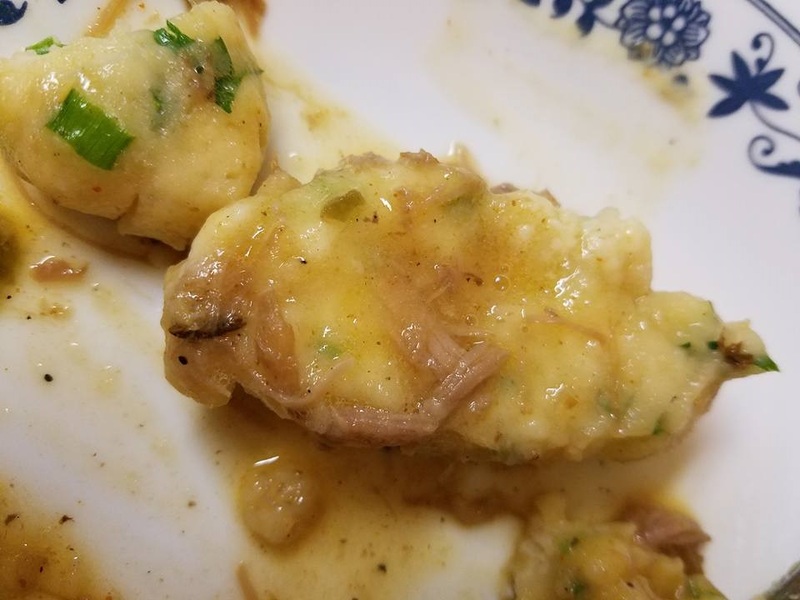 When dropping the dumplings, you may have to add water to the gravy you're cooking it in. It has to have enough water to be able to cook them in it. If you don't have a lot of gravy, you can pour gravy over the top of the dumplings, then flip the dumplings once the bottom cooks a bit. Cook closely covered for 10-15 minutes. Over cooking will make the dumplings tough and chewy. When cooked just right they are very light and fluffy when you bite into them.